The Rabbi with a Blog (Rabbi Jason Miller): Technology and Electronics at Summer Camp: Will Policy Change? Technology and Electronics at Summer Camp: Will Policy Change? School is back in session in many parts of the country and that means the summer camp season has come to a close. With each passing summer, I try to evaluate the role that technology plays at sleep-away camp. It seems that each year more summer camps institute "screen free policies" concerning the use of technology and electronics at camp, but other camps are gradually relaxing their policies (e.g., letting staff keep a cellphone in their pockets during the day, not checking for campers' Wi-Fi-enabled devices on trips out of camp, etc.). 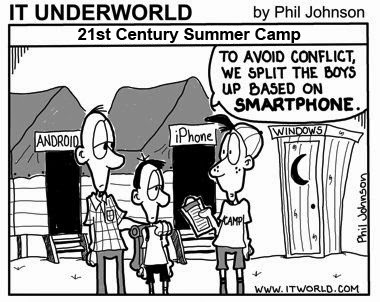 Last week I published the following piece on The Huffington Post's website about technology and summer camp. It has already generated a lot of discussion about appropriate use of technology at summer camp and what the future might look like. Sitting with my wife by the lake in Northern Michigan at the beginning of the summer I listened as the director of our family camp, Camp Michigania, recited the rules for the week. "One final thing we ask everyone to abide by," he said to the assembled adults, "please keep your children from using any technology this week and try not to use your own cellphones and computers in public." I noted the irony that he had just read his annual list of policies and procedures from his iPhone. I am a techie, but I am also an advocate for summer camp. I respect those who believe that our kids should leave anything that requires a rechargeable battery at home before getting on the bus to sleep away camp -- hard as that may be. But I also wonder if we're setting ourselves up for failure. Just how far into the future will we be able to continue banning communication devices from these children of the digital age? The argument against allowing these young campers to import their technology to camp is that they need a chance to unplug and to be fully present without any influences from the outside world. But those influences inevitably sneak into summer camps each year. Overnight camp counselors use the Internet after hours and on days off and then keep the campers abreast of what's happening in the world. Communiques in the form of one-way email messages, faxes and even hand-written letters from family members alert them to the goings on back home. Summer camp for our children is akin to a vacation for us, but aren't we all guilty of sneaking a peek at our email while on vacation? Is the expectation that our kids shouldn't have that ability a double standard? We would be fooling ourselves to believe that technology can be totally barred from camp. In the second decade of the 21st century, electronic gadgets are everywhere. Camp itself has become reliant on technology as staff members regularly use smartphones to check for impending storms, camp directors send newsletters home via email, digital photos are posted nightly for the eager parents, and the camp social worker is never far from her cellphone to text mom about her homesick daughter. Some camps let the children bring Wi-Fi-enabled devices and even mobile phones to camp, but mandate the appropriate times for usage. "Multimedia" is a daily activity at some camps along with canoeing and crafts. Campers take photos with digital SLR cameras and then use computer applications to edit them, while counselors may be using other computers in the room to post photos to Instagram or browse their Facebook feed. So what's the right answer? Should camp leaders continue to ban campers' use of technology or begin to embrace policies of acceptable tech use? I asked camp expert Jeremy J. Fingerman, the CEO of the Foundation for Jewish Camp what he thinks. "Camp is a wonderful opportunity for kids to unplug from technology, providing them the freedom to develop deep relationships and communication skills without distractions," Fingerman wrote in an email. "I often hear from parents that camp provides a much needed break and a chance for kids to just be kids." That makes sense. Summer camp should be a refuge for the screen zombie kids whose idea of exercise is going to get more snacks while playing Xbox. Tech gadgets would certainly compete with the immersive experience that sleep away camp creates for the young people. But does technology have no place whatsoever in the lives of campers? Some obsolete technology has been ruled acceptable at some camps. Before sending my oldest child to Camp Tamarack in Ortonville, Michigan, this summer I was forced into the basement to dig deep into the box where our outdated tech gadgets go to die. Usually one to embrace the latest in technology, I was on a mission to find an old model iPod with no Internet capability and no screen to view videos. That was the only music device he was permitted to take (the Sony Walkman I took to the same camp three decades prior was deemed too archaic). Specialty camps like Camp Inc., the new overnight camp in the Rockies for entrepreneurial teens, embraces technology. Campers unplug for a few hours each day to jump in the lake, go boating, play volleyball, and hike in the mountains. But then they plug their camp-issued notebook computers back in as they work with fellow campers on their startup companies. I visited Camp Inc. in July and a summer storm took out the phones and Internet service at the camp one day. Campers and their counselors alike didn't know what to do without access to the outside world and no electricity to fire up their computers. It was like a traditional sleep away camp from a simpler time before the Internet existed. It could be a nice experience, but not at a camp where the "Shark Tank" format startup pitches serve as the camp's Color Wars. American adolescents spend more than 7.5 hours each day using an electronic device and the proliferation of built-in wireless technology has made it increasingly difficult for summer camps to strike the balance of allowing some electronics instead of others. At B'nai Brith Beber Camp in Wisconsin, executive director Stefan Teodosic is proud of his camp's "Screen Free Technology Policy," which he helped craft in 2012 with input from parents and campers. The camp's director of operations explains the technology policy in a video embedded on the camp's website. In the video, he admonishes parents to please leave all expensive electronics at home. "These devices have a way of getting lost or broken at camp, and sometimes even stolen," Camp Beber's policy explains. "The only electronics allowed will be screen-less music players and digital cameras. All other music players, eBook readers, portable game devices, and video players should remain at home. Period. Camp is one of the few places throughout the year where kids can truly unplug." Most overnight summer camps will continue to discourage technology that interferes with their stated mission of promoting socialization between campers and instilling a love of the outdoors. The screen free policies also help remove divisions between the campers who come from families that can afford expensive technology gadgets and those that cannot. Technology is all around us, but we can strive to give campers a hiatus during the summer from staring glassy-eyed at screens both big and small. Their much needed break from the world of technology is healthy and they can certainly detox from their cellphones, tablets, iPods, game consoles and laptops for a few weeks. As time goes on, however, a completely screen free summer may be unavoidable. Striking a healthy balance will be a recipe for success.